We are a family run professional carpet cleaning company. We’ve provided our services, experience and expertise in both domestic carpet cleaning and commercial carpet cleaning Cheltenham for 10 years. Advanced stain treatment and stain protection are also amongst our offered services. We can carpet clean commercial properties such as offices, schools, pubs, restaurants, hotels, retirement homes and local authority. We shall go into greater detail about our services later. 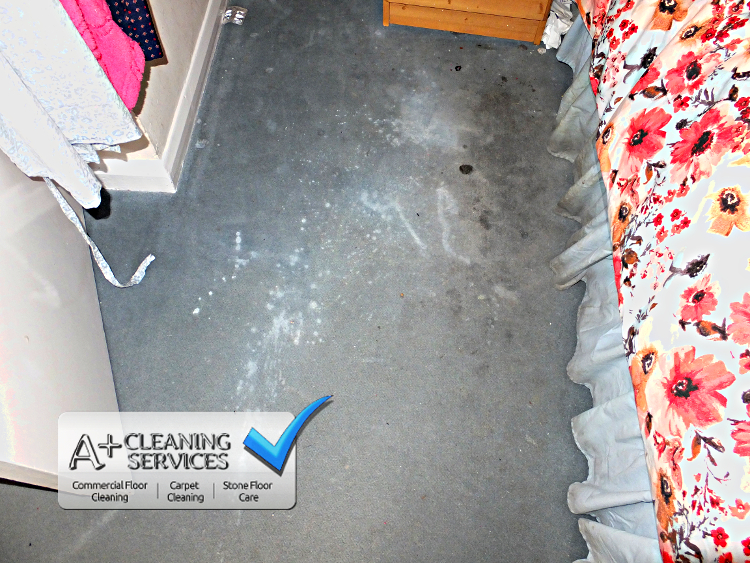 Carpet Cleaning Cheltenham – This bedside has taken some serious punishment over time, will we be able to rescue it? Carpet Cleaning Cheltenham – We made it just in time! We’re happy to say this carpet will live to see another day. There will always be a cheaper carpet cleaner. But choosing by price alone means you run the risk of using someone inexperienced, unqualified and uninsured. 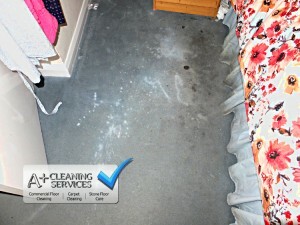 The consequences could cost you your carpet, with no one to take responsibility for the damage. 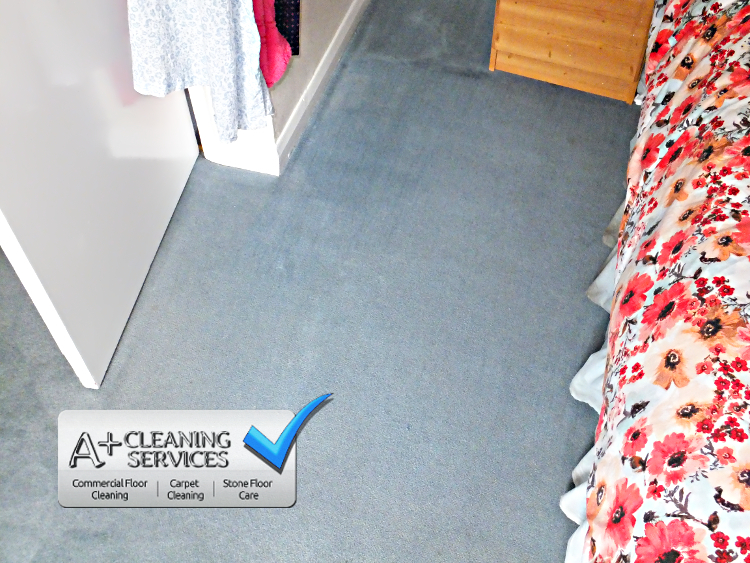 Choosing to use a hire machine could be the worst thing for your carpet. Hire machines are ill-suited for the job at hand, namely, removing water and shampoo from your carpet. This is because they are underpowered. If they were any good, we’d be using them. The cleaning technology these hire machines use is shampoo, from the 1970’s. Shampoo is notoriously sticky and hard to remove. You need ample water flow and vacuum power to thoroughly rinse the carpet. Ironically both these aspects are lacking in hire machines. This results in a sticky carpet that gets dirtier quicker. You will then hire the machine again to clean the carpet a few months down the line. The carpet gets dirty quickly again. And the cycle continues. A little too convenient for the company making money out of this, don’t you think? Thankfully, the modern cleaning science available to us today is leaps and bounds ahead of shampoo technology. Our favourite cleaning solution is colloidal and made from 100% plant based ingredients. Colloids are unique. They’re good at breaking down soil, grease, odours, microbes and viruses, fleas, carpet moth and dust mites. This is possible because the colloid works by smashing into these offending molecules and organisms. The colloids fragment on impact, into increasingly smaller particles. This characteristic is what allows a deeper clean than ever before. Colloids are also free rinsing, so having a sticky carpet is no longer possible. Sometimes there is a particularly difficult stain. It doesn’t want to remove for one reason or another. Often it’s because it’s old, or an ink based stain. Sometimes it can be from being cleaned with, you guessed it, DIY chemicals. Regardless, these stains exist and are unlikely to respond to typical cleaning methods. Advanced stain treatment, or “Plan B” as we like to call it, opens up possibilities previously unavailable. Many companies do not even know these techniques. Carpet Cleaning Cheltenham – This landing carpet also took a beating from the kids. Oily black stains on a pale carpet, what more could you ask for? 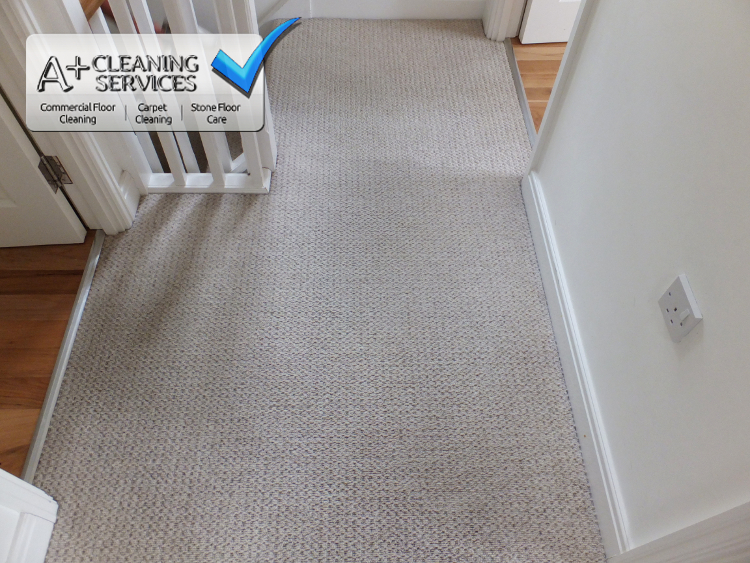 Carpet Cleaning Cheltenham – The carpet responded to cleaning without any issues. The carpet looks extremely presentable now. Stain protection is often overlooked due to the belief it is overpriced or that it doesn’t work. Admittedly if your carpet is quite old, stain protection probably won’t be worth your while. However, a fairly new woollen carpet would definitely benefit from stain protection. Your protector will shield the carpet from stains, spills, and general wear and tear. 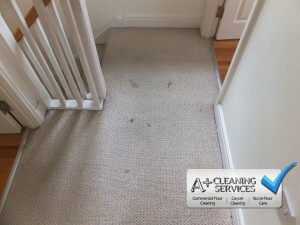 One added benefit of stain protection is that it actually makes the carpet cleaning more effective. So if you want to maintain your carpet completely over the years to come, stain protector is certainly worth thinking about.